Samuel Herrera slips through the enemy's defense. 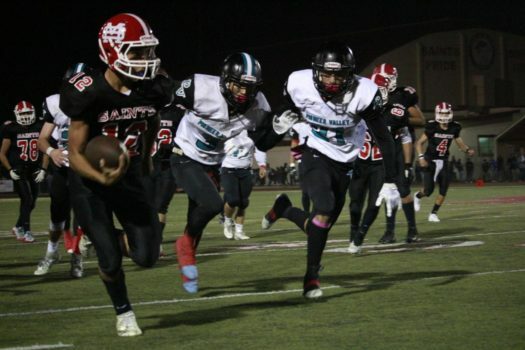 On Friday, October 26th, our Saints’ football team faced off against our known rival: Pioneer Valley. Many of us, including myself, came into this game knowing it would be our last time watching a home game during our high school years; so we all not so silently agreed to go out with a “bang”, literally. The bleachers were roaring, chants were shouted, and the stakes were as high as the baby powder, fireworks, and streamers thrown into the sky that night. With a game to match our excitement in the stands, our boys on the field put on a show and fought hard. The players of the game were #12 Samuel Herrera (Offensive), #64 Brayan Soriano (Defensive), #32 Adrian Arredondo (Special Teams), and #2 Kenneth Olpindo (Overall). In the end, we lost with the score standing at a final 27-14. But despite the 13-point deficit, I bet that even P.V. would agree with me and many others in saying that we won in displays of spirit, loyalty, and most importantly pride. It is an amazing feeling to be down by the field, watching the game up close and still feeling the magnitude and vibrations of our students stomping their feet in the bleachers. No seat was left empty up until the last minutes of the game. We participated in doing the wave and cheering, making more noise than our visitors could believe. Our game resembled more of a festival than a high school sporting event. And, to top it off, when the clock counted down to 0, our band played our team off with one last classic saints victory song that we all are familiar with, as if the scoreboard wasn’t even there. As trumpets triumphantly rang through the night for the last time I’ll and many of my friends will hear after 4 years here, I was certain even though P. V. had played well and won the game, we were NOT DEFEATED.